Cytokeratin 17 (CK17) is normally expressed in the basal cells of complex epithelia but not in stratified or simple epithelia. T24 cells or Skin. Bladder or Cervix. Cytokeratin 17 (CK17) is normally expressed in the basal cells of complex epithelia but not in stratified or simple epithelia. 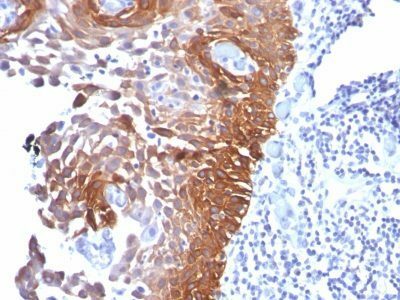 Antibody to CK17 is an excellent tool to distinguish myoepithelial cells from luminal epithelium of various glands such as mammary, sweat and salivary. CK17 is expressed in epithelial cells of various origins, such as bronchial epithelial cells and skin appendages. It may be considered asepithelial stem cellmarker because CK17 Ab marks basal cell differentiation. CK17 is expressed in SCLC much higher than in LADC. Eighty-five percent of the triple negative breast carcinomas immunoreact with basal cytokeratins including anti-CK17. Also important is that cases of triple negative breast carcinoma with expression of CK17 show an aggressive clinical course. The histologic differentiation of ampullary cancer, intestinal vs. pancreatobiliary, is very important for treatment. 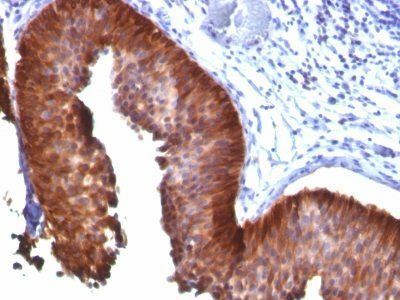 Usually anti-CK17 and anti-MUC1 immunoreactivity represents pancreatobiliary subtype whereas anti-MUC2 and anti-CDX-2 positivity defines intestinal subtype. Catalog number key for antibody number 0158, Anti-Cytokeratin 17 (E3) The prefix indicates conjugation, followed by the antibody number and size suffix.